Hayula: Indonesian Journal of Multidisciplinary Islamic Studies is a multilingual (Bahasa Indonesia, Arabic, and English) and peer-reviewed journal, published biannual since 2017 (January and July). It covers the area of broader Islamic Studies which includes study of Qur’an, Quranic Exegesis, Hadith, Islamic Philosophy, Theology, Islamic Education, Dakwah, Islamic Economy, Muslim Societies and Culture, Islamic History, Languages related to Islam, and Islamic Mysticism. 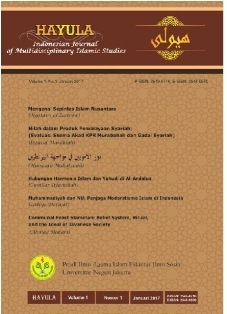 This journal is published by the Department of Islamic Studies, Faculty of Social Science, Universitas Negeri Jakarta.